Happy Friday Everyone! I've been in a funk the past few days. I miss my running. It's only been a few days, but I use running as my stress reliever. Recently life has been too much to deal with...talk about stress overload! The elliptical isn't cutting it so any suggestions on how to get out of this funk would be greatly appreciated. But I didn't want to miss the opportunity to link up again with Courtney from Eat Pray Run DC. The topic for today is the Top 5 reasons to Run ______. I chose running a half marathon because I no longer run full marathons. I say this now but I keep reading other blogger's training for fall full marathons and I must say it is giving me the running itch. Meeting new friends: I must admit the running community is pretty awesome. We really like to support one another and really truly want everyone to reach their PR (personal record). I used to not run with others but now I love it! We motivate each other and support one another when we have lousy days. I even like to train with a fun running club from a local running store. You inspire others: I never realized how much of an impact I have made on certain people. Some have come up to me thanking me for getting them to enjoy running. They started with running a 5k and are now up to running a half marathon. It is really a great feeling. It is the greatest domino effect cause then they begin to inspire others. The training: It is pretty awesome seeing how much you are able to accomplish when you set your mind to something. My favorite running mantra right now is, "The body can achieve what the mind believes." I remember when I could barely finish a few miles. I would be so winded and out of breath. Then I started seeing a significant change. I was meeting all my benchmarks and improving consistently. It was and continues to be one of the greatest feelings...accomplishment. Although training can be difficult it is so worth it. Just think you are really only "half crazy" since you aren't running 26.2 miles just 13.1 miles. Eating Anything and Everything: Let's face it, when you are training for a race you are burning a ton of calories. So there is no surprise why I get hungry all the time! I can completely justify eating a humongous burger and fries after running 10 miles. It pretty much evens each other out right? Obviously can't eat like that everyday but completely justified after doing a long run. The Bling: I love running across that finish line, getting that sense of accomplishment, and getting that beautiful medal. It is the greatest symbol of hard work. I have such a variety of medals that I have collected throughout the years from boot shaped medals to actual Tiffany's necklaces from running the Nike Women's Marathon. Each one has a story of my training and hard work. Oh and along with the medals you also get the finisher running t-shirt. I've even ran some races where they gave sweaters, ear phones and coffee mugs. Gotta love all the freebies! Why do you run half marathons? I love that mantra! I think that one of the best parts of distance running is the accomplishment of completing the training- that alone is something to be extremely proud of! 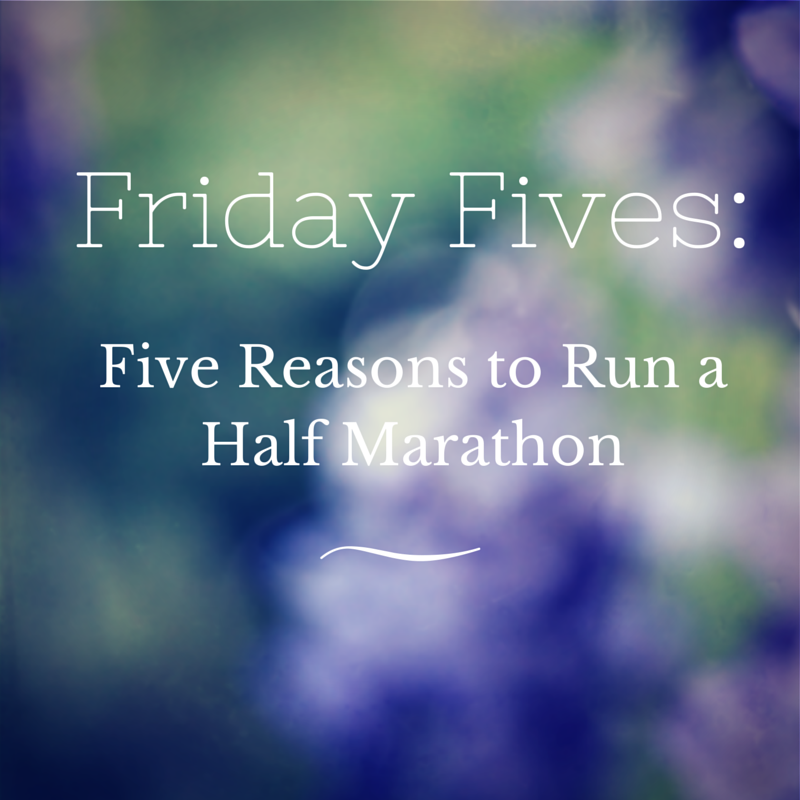 Those are all great reasons to run a half! Great points Daisy! I've met so many new friends this year (mainly from blogging - but several are running half marathons). I also love running halves b/c it is a great excuse to travel. I'm going to have to borrow your mantra during my next round of training. Our running community is pretty amazing :) Friends make everything better, especially running! These are some great reason! It is always great when you can be an inspiration to others! Half marathons are my favourite event. I run them because they give me a sense of accomplishment, and I like the training. Enough to be tough, but not enough to totally take over your life. It is always good to run marathons as it helps to judge your training effectiveness. But in order to even complete a half marathon, you need to have sufficient stamina along with strong willpower. I would just like to suggest that one should also run on synthetic tracks to build more stamina and it will also help to increase your speed of running. And it is more important to complete the marathon as not everyone does that.